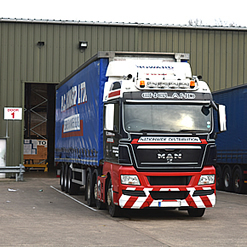 PC Howard Limited is much more than a traditional haulier. We are one of the UK's most experienced 3rd Party Logistics providers (3PL). We offer a completely scalable distribution and logistics service for your business where storage, stock management and transportation are all integrated together into one single and effective solution. Our 3PL services are ideal for companies looking to distribute their stock throughout the UK whether this company is UK based or an International company looking to import. PC Howard offers an enviable array or resources and back office systems to facilitate the 3PL process. Our infrastructure is specifically geared to get your goods to market. We can take you goods in bulk, re-package and split them into separate consignments and transport them to their destination whether on the UK mainland or across Europe. Everything is design and implemented to offer a high quality and expedient solution for your business.